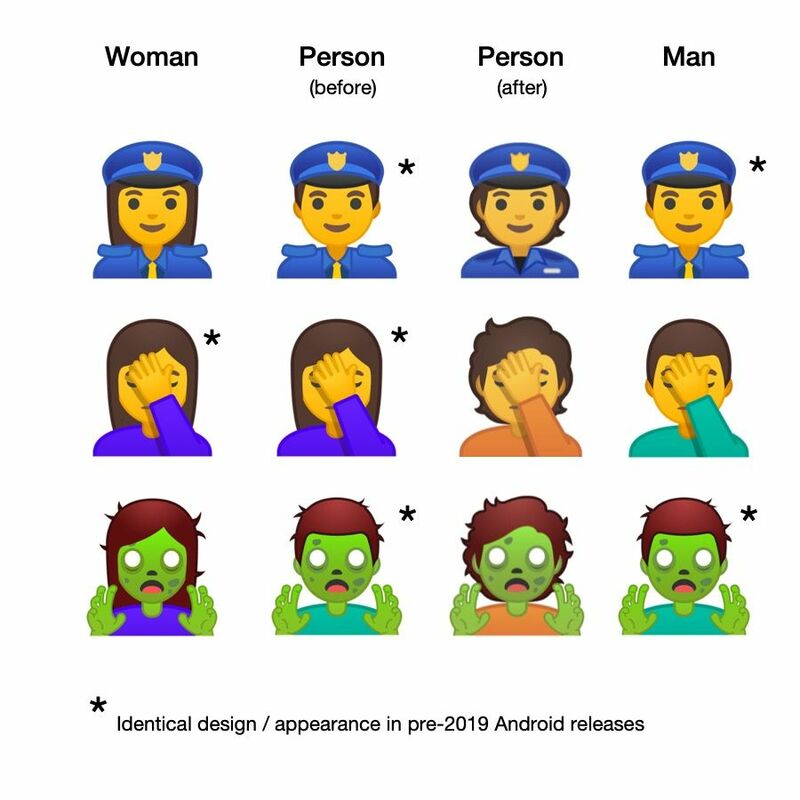 Coming to Android this year: a third gender option for emojis such as Police Officer, Zombie, Person Facepalming, Construction Worker and People With Bunny Ears. Revealed by Google in a submission to the Unicode Consortium last week, these changes signal a new direction from Google which has in recent years played ball with other vendors in overlooking Unicode guidelines, in favor of cross platform compatibility. Above: Google will introduce a distinct appearance for emojis which don't specify any gender in 2019. Image: Google designs / Emojipedia composite. In giving public notice via Unicode, Google hopes that other vendors will join them in this effort to standardize many of the emoji which don't specify a gender. This builds on an initial few gender inclusive revisions made by Google in 2018. Google makes the case that at present, many emojis have three variations already — it's just that vendors choose to only represent women and men for the majority of these. Above: A number of emojis don't specify gender, but get an inconsistent gendered appearance. Image: Jennifer Daniel / Google. 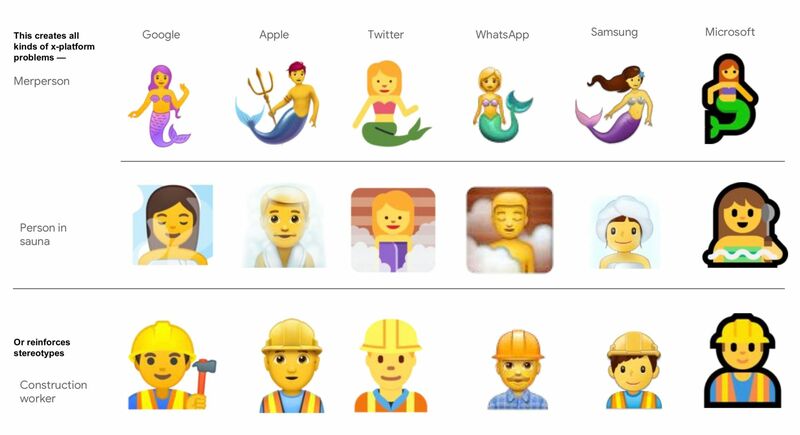 By updating the appearance of any emoji which doesn't specify gender (such as 🧜 Merperson or 👷 Construction Worker) to use a gender-inclusive design, Google hopes to reduce friction when sending any of these code points between platforms. For instance, the emoji for 🤦 Person Facepalming - if sent from iOS to Android at present, it would change from what appears to be a Man (on iOS) to a Woman (on Android). Additionally this will allow more flexibility for end users (those who want to mention a police officer, but it's unimportant to note whether they are a woman or man); and provide more inclusive options for those who might not identify with either of the two options provided at present. With this change, Google will give a gender inclusive appearance to emojis which do not specify a gender. Above: A demonstration of the new designs coming to Android in 2019. Image: Google. 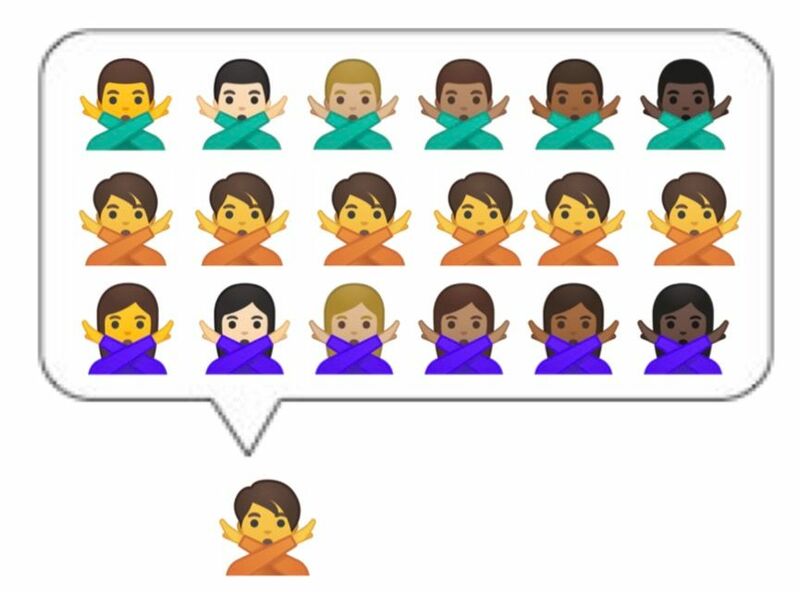 What makes an emoji "Gender Inclusive"? “Gender is not a haircut but at emoji size that seems to be a primary signifier to communicate what may be an impossible task as it relates to this construct. Gender lives dynamically on a spectrum and there is no single visual design “solution”. So it's partly a matter of appearance, but also to make sense of an increasingly complex emoji keyboard. At present some emojis support one gender, some have two, and others have three. Again, Jennifer Daniel: “we need to consider implementations and designs that scale appropriately and are intuitive and useful to navigate”. Under Google's proposed interface, the default appearance for each (human) emoji would be to show a gender-inclusive option without skin tone on the keyboard by default. This is already an approach Google uses in Gboard, which differs from iOS and Samsung which display the variations for women and men as separate entries on the keyboard. Many users likely wouldn't object or care too strongly about which flavor of face palm they send. Where it's relevant, users can press and hold (as they do now to select skin tone on most platforms) to choose both gender and skin tone at the same time, from a choice of three rows. This "three row" interface would only apply to emojis which have already three gender options in the Unicode Standard. One, or two rows would presumably be shown where the emoji list doesn't recommend three gender options. For historical reasons and sometimes technical decisions, not every emoji has these three gender options listed in Unicode's emoji documentation. Many newer emojis — including gendered professions proposed by Google in 2016 — only have two options listed as Recommended for General Interchange (RGI) at Unicode. These include the judges (👩‍⚖️ Woman Judge or 👨‍⚖️ Man Judge), pilots (👩‍✈️ Woman Pilot or 👨‍✈️ Man Pilot) and even newer additions of people with probing canes (👩‍🦯 Woman With Probing Cane or 👨‍🦯 Man With Probing Cane). Separate proposals would need to cover adding additional gender options to Unicode's RGI emoji list. Google notes it is “likely to propose additional sequences to cover gaps in the Unicode Standard” in the future, and that this is only the beginning. One area that sometimes trips up a casual emoji user is the distinction between what the Unicode Consortium specifies and how platform vendors (such as Apple, Google or Microsoft) implement those characters. Despite this, it's been long-standing practice for companies (particularly Apple) to use designs which are backward-compatible with previous sets. 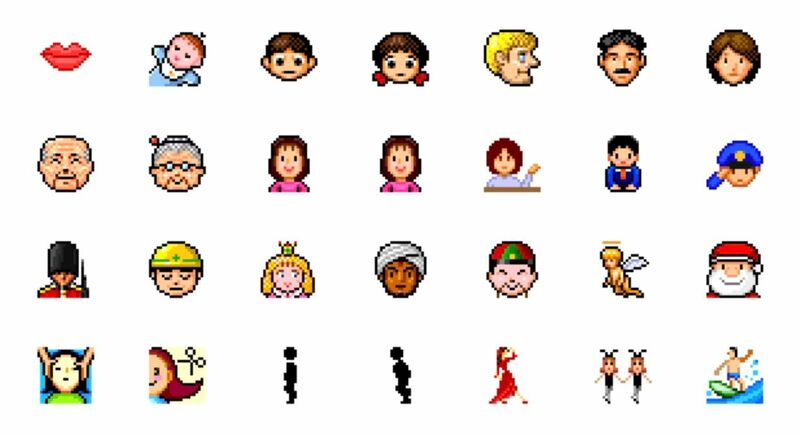 Notably, the emoji set that Apple's implementation derives from (SoftBank), had particularly gendered designs for a number of characters where no gender was specified when these were incorporated into the Unicode Standard. Above: Apple's emoji set was largely created to be compatible with SoftBank in Japan. Image: SoftBank / Emojipedia composite. Further documents from the Unicode Emoji Subcommittee have further looked at the issue, and many supporting documents have been submitted highlighting where the inconsistencies lie within the Unicode emoji set. An article about gender representation within Google's emoji set wouldn't be complete without comments online (usually, but not exclusively from white men) stating "we should go back to blobs that had no gender or skin tone, easy!". In a world where Google was the only emoji creator, this may have been entirely possible, and would remain a possibility. In a cross-platform world, there's a lot more at play. 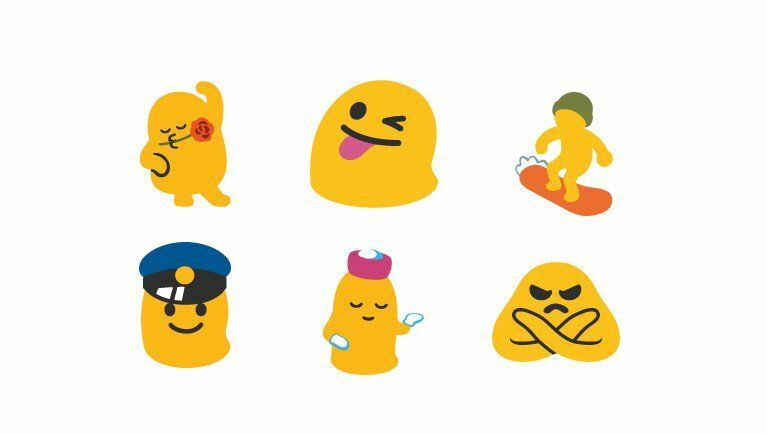 Above: Non-human blobs existed on Android, before gender or skin tone options were added to the Unicode Standard. Image: Google Android 5 designs / Emojipedia composite. If Google merely switched to genderless, skin-tone-less blobs today; meaning and context would be lost cross platform. One can make the case of whether Unicode should have (past context) added skin tones or gender, but the reality is today the Unicode Standard has these, and no Android is an island. As an aside, at the time the blobs existed on Android, the feedback sent to Google was often not supportive of the choice. People sent a woman in a red dress from iOS or Twitter weren't necessarily pleased at the blob with a rose in its mouth that arrived on Android devices. Until now, Unicode has been reticent to add new sequences for gender neutral options, while 50+ emojis already exist which could already be used as gender neutral options, and have until now gone under-utilized by vendors. Having a major company such as Google make a public stand on using the existing gender inclusive emoji options could be the action that paves the way for Unicode recommending a consistent set of gender options for all human emojis. Expect to see these designs in an Android release from Google this year (likely a later release of Android Q), and time will tell if other vendors also adopt similar designs for the same code points. Note: Emojipedia is a voting member of the Unicode Consortium and I represent Emojipedia at Unicode Technical Committee meetings.